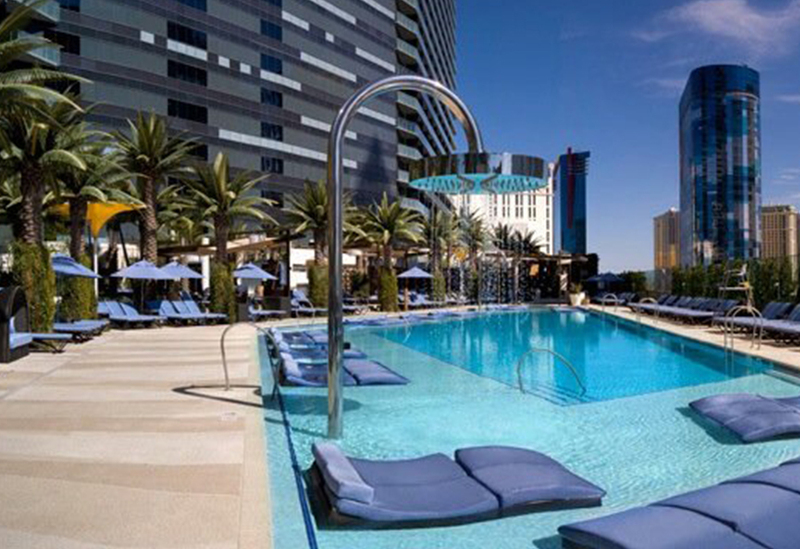 Following an eye opening First Impressions of the Mythical Las Vegas , our choice of accommodation – The Cosmopolitan, set the stage for the rest of our visit to be filled with disbelief and immeasurable grandeur. 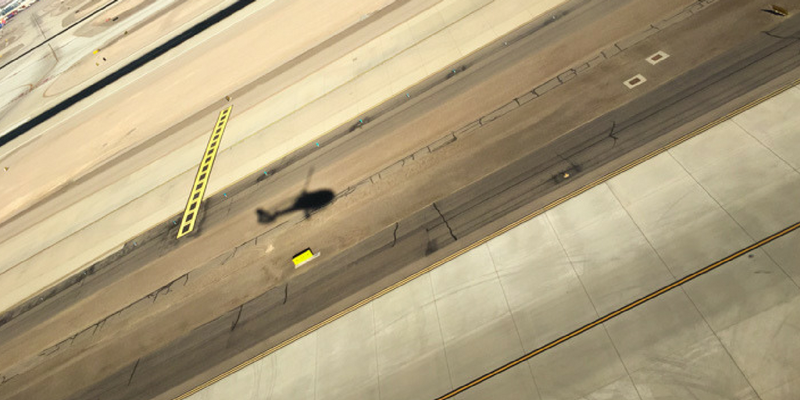 None the less, home to 6/10 of the worlds largest hotels, choosing your base within Vegas can be somewhat overwhelming. The city houses an endless amount of accommodation, with each hotel offering a unique niche, style and experience. 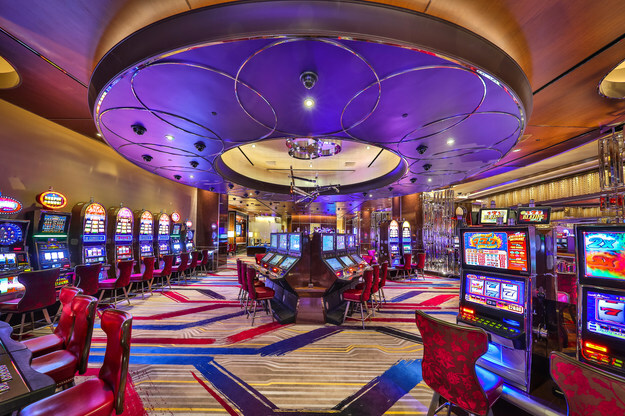 Composed of two interlinked towers reaching up into the sky, the Cosmopolitan is an impressive structure to say the least. This said, it does not particularly stand out. Between the Golden tones of Mandalay Bay and the mid century style of the Paris hotel it in fact seems somewhat boring. 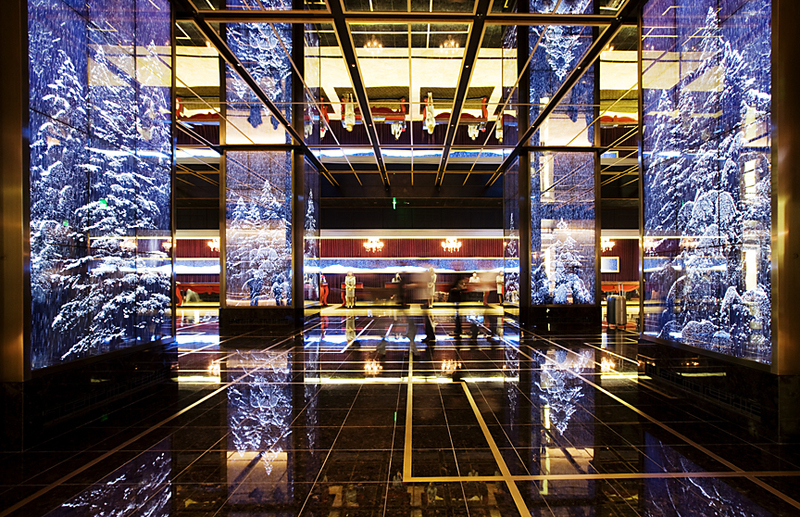 Upon entering the building however, this impression is quickly dissolved… It’s extensive lobby is lined with tones of marble, creating a feeling of exclusiveness. Meanwhile, large pillars are mounted with screens which play differing hypnotic sequences of colour and moving objects, a unique experience which you would only find in Vegas! 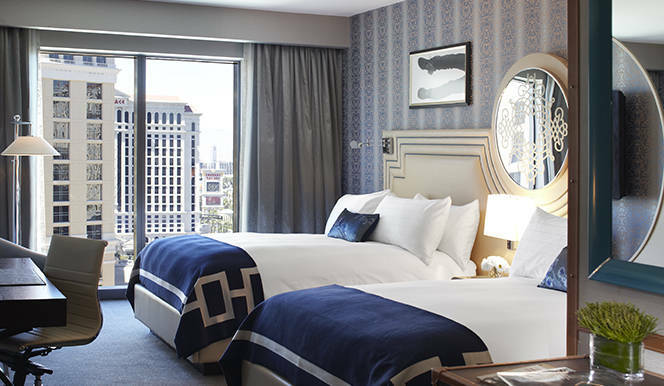 Due to the scale of the hotel, like most in Vegas, rooms vary dramatically in price. The cheapest, the ‘City Room’ (which encompasses two queen sized beds) comes in at $150 per night. As my dad always says, if you look after the penny’s the pounds (dollars in this case) will look after themselves. Thus, this was my room of choice! Despite being the cheapest that the hotel offers, its still elegant, modern and perfectly clean. Its by far the nicest room I stayed in during the All American Road Trip! 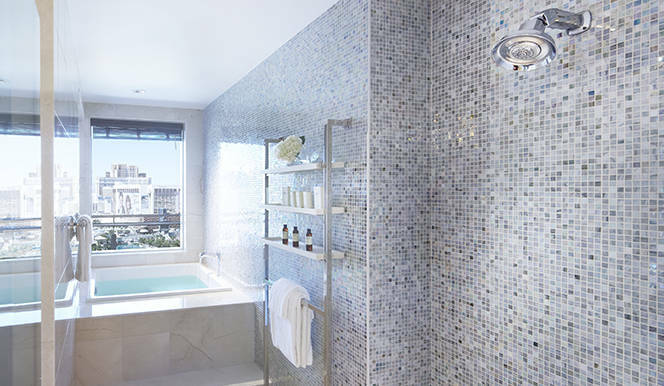 The rooms en-suite hosts an impressive shower – but no bath. Staying for only one night, this was of no bother. 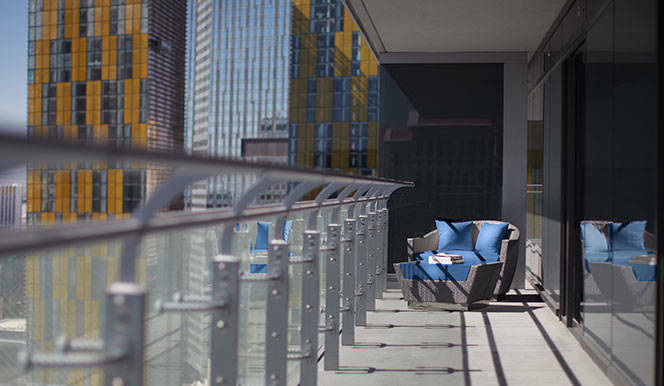 But, for $190, a Terrace studio room comes with a ‘deep Japanese soaking tub’ from which, you can soak and admire the Vegas skyline… This fact does make me wish that I’d dug into my pockets for a more expensive room. The Terrace studio also comes with a balcony and mini fridge (two more things which the cheaper City Room does not). In this case however, I don’t feel that I particularly missed either during my stay. Sure a balcony would have been nice, but large panoramic windows offer the same spectacular view. Further, as the golden rule of travel is NEVER touch the minibar, it seems of little importance that my room did not come equipped with one. 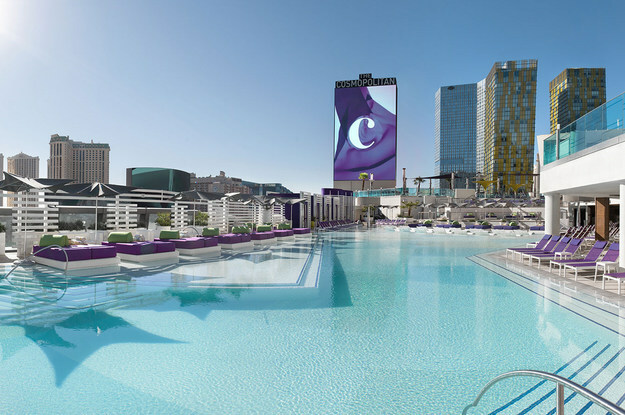 TOP TIP: The cosmopolitan charges $230 to bump either rooms up to a ‘fountain view’. This is simply a way for them to make more money. From our ‘standard’ room we had an excellent view of the Bellagio fountain display… So don’t be pulled into this trap! Where to start with the facilities this hotels offers? Well, for starters there’s three YES THREE pools… The first of which, the so named ‘boulevard pool’ is the biggest. As such, it plays host to the hotels parties day and night. If this isn’t your scene, the scheduled Bamboo pool offers a more relaxed vibe up in the clouds. Be sure to bring your camera because you’ll no doubt get some amazing shots of Vegas from the comfort of your lounge chair! 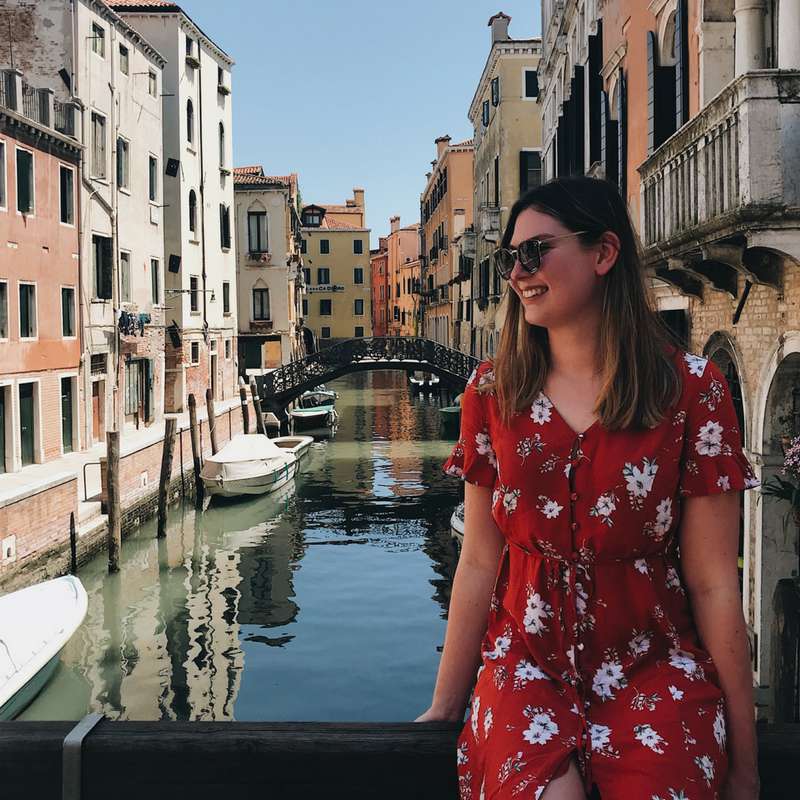 If you get bored of laying around and snoozing off the inevitable hangover, every nook and cranny of the seemingly endless resort is filled with things to do. A trip to the award winning spa perhaps, or some light shopping… Yes there are actually boutique stores within the hotel! crazy right? As its Vegas, the real star of the show is the casino. Entering the hotel from the underground car park, we were immediately greeted by its flashing lights and general sense of excitement, a far cry from the modernist feel of the rest of the hotel, the classic style of the casino makes you feel as though you’re featuring in a bond film. 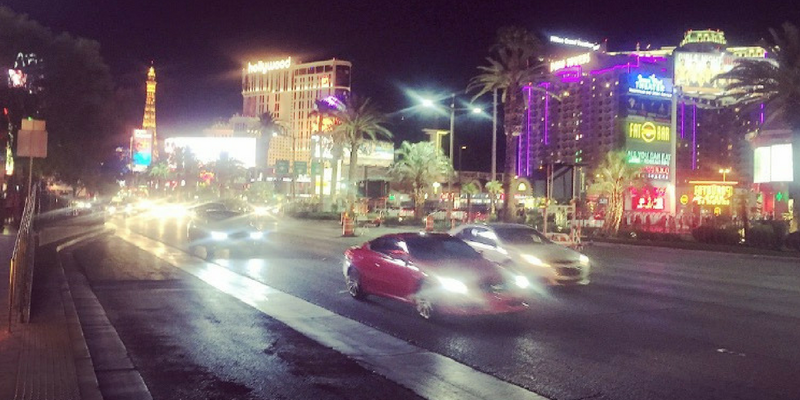 Overall, the Cosmopolitan is grand, flashy and everything you could hope for. Its colossal structure means you could spend your whole visit to the city within its walls and not get bored… you know if you wanted. Would I stay here again? 100%, I don’t really have a bad thing to stay about this impressive hotel which, as it goes, is pretty rare.